Exemplify who you are as a couple in your wedding vows. Whether you’re funny or sweet or intimate or fun; let that shine through in your vows. Express what brought you two together and where you plan to go from here. Saying something like “I’m so thankful our love for Craft Beer brought us together, and I can’t wait to drink it with you when we’re old and grumpy” details who you are as a couple, your shared interests, and future plans. Funny vows often show a couple’s real personality. Vowing never to interrupt a Cowboys Vs. Eagles football game is an example of how well you know and care about your partner and their love of sports. 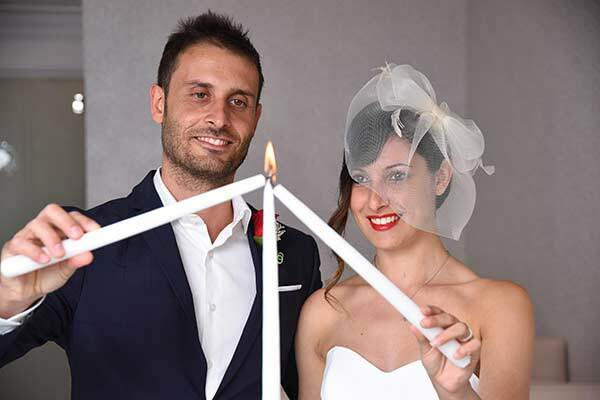 Unity Candle- The bride and groom both hold a lit candle and together they light a bigger, third candle. This represents the bride and groom coming together as one and the bright future they will share together. Lasso Ceremony- After the bride and groom exchange wedding vows, a “lasso” is draped around your shoulders in a figure 8. The lasso represents binding the bride and groom together as one, and a figure 8 represents your everlasting love. 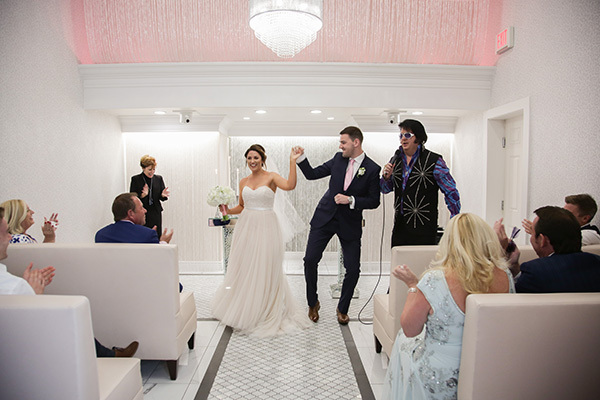 The lasso is often placed over the bride and groom by the officiant, but to add a personal touch you can always ask a special family member to do the honor. Pass the Rope or Tie the Knot- In some ceremonies, the bride and groom pass a rope around for all their guests to bless. When it gets back to the bride and groom they “tie the knot.” This represents their lives being strong and tied together as one. Blending of the Sands- The bride and groom each have a small jar of sand, both are a different color. At the same time, they pour their sand into a larger jar. This is another ceremony that represents blending your lives into one. This ceremony is perfect for beach-themed or outdoor weddings. 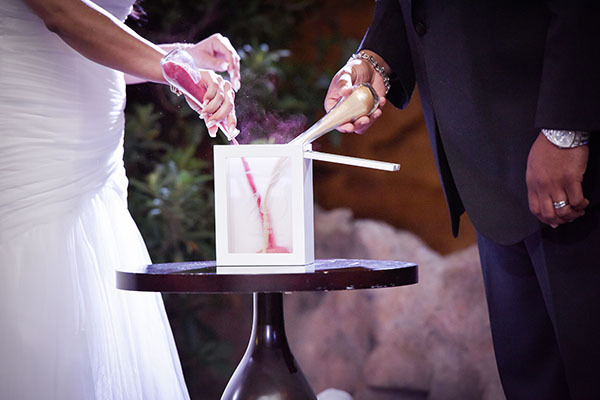 Love is Sweet– This is an idea to replace your unity candle ceremony. Before the ceremony, place candy in each guests’ seats. After the bride and groom exchange vows, ask your guests to eat the candy they received. This represents the “sweetness” of your love together. 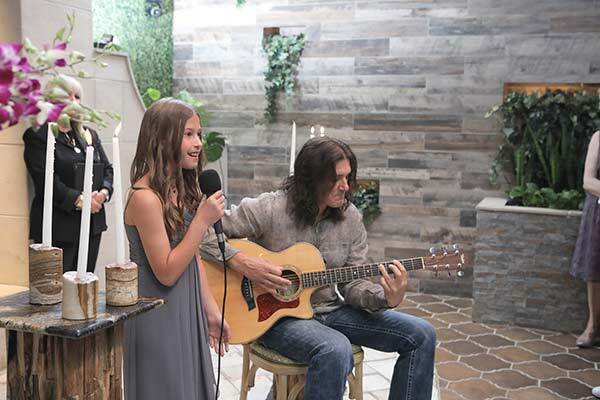 Special Readings- Sometimes there is a poem, excerpt from a book, or a song that the bride and groom feel represent their love best. This is a great way to personalize your wedding ceremony. It also gives your guests a representation of who you are together! Before your ceremony, distinguish what will be said during your ceremony and reception. Don’t make your guests sit through the same speech twice. Check with your partner to make sure both of your wedding vows are similar in length. A useful guide is 1000 words or under. Keep your ceremony short and sweet. Chapel of the Flowers specializes in 10-15-minute ceremonies all while keeping it personal and intimate. Guests don’t want to sit too long and get eager for the reception, save long speeches for the reception. Most ministers often prepare to personalize your ceremony and will add anecdotes of your love story. 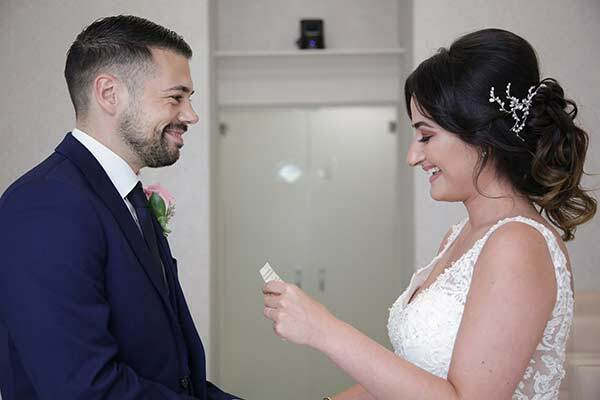 If you choose to add a personalized touch like the ones we have mentioned, let your officiant and wedding planner know beforehand. This helps ensure your wedding ceremony goes perfectly and stays on time! It’s always best to give your vows to your officiant a week before your ceremony. Ministers will always have an extra copy in case you forget on your wedding day. 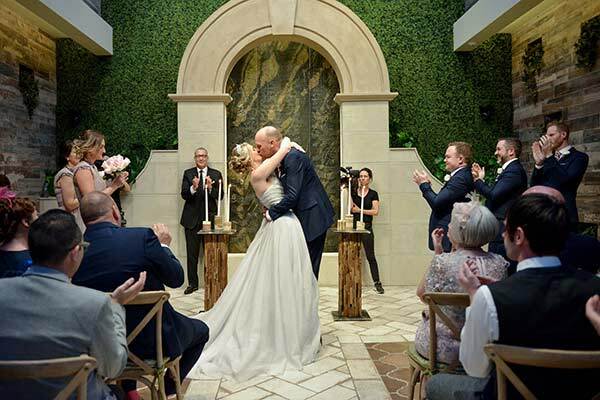 At Chapel of the Flowers, our officiants like to review them to ensure they are appropriate for the live broadcasting of your ceremony. If there is a surprise (like you want to walk down the aisle to a song your significant other doesn’t know about) or you just wrote your vow the night before, let your wedding planner and minister know before the ceremony. By doing this, you keep the element of surprise for your guests and fiancé but allow the wedding staff time to prepare for these last-minute changes. Your wedding day should be everything you’ve dreamed of. These wedding vow tips and personalization ideas hopefully help you create a more romantic and memorable wedding day – one that reflects your fiancé and yourself . 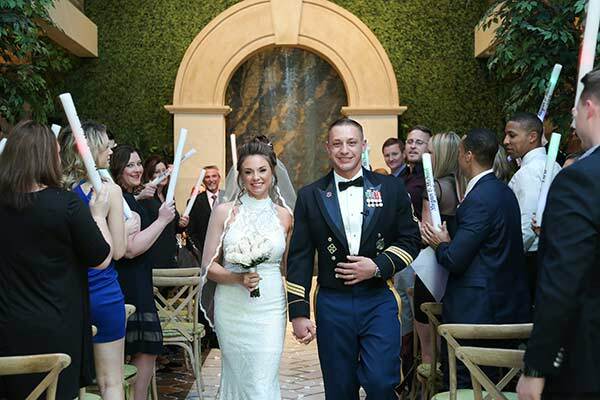 If you’re interested in all-inclusive wedding packages and a stress-free day, Chapel of the Flowers in Las Vegas offers a bundle of cost-friendly packages and professional wedding planners to make your wedding day the best one yet!